Istanbul Bombing: Investigators Focus On Russian-Speaking Bombers : Parallels Turkish authorities believe the Istanbul bombing points to ISIS and a cell of Russian speakers, a contingent that makes up a large portion of the terrorist group. 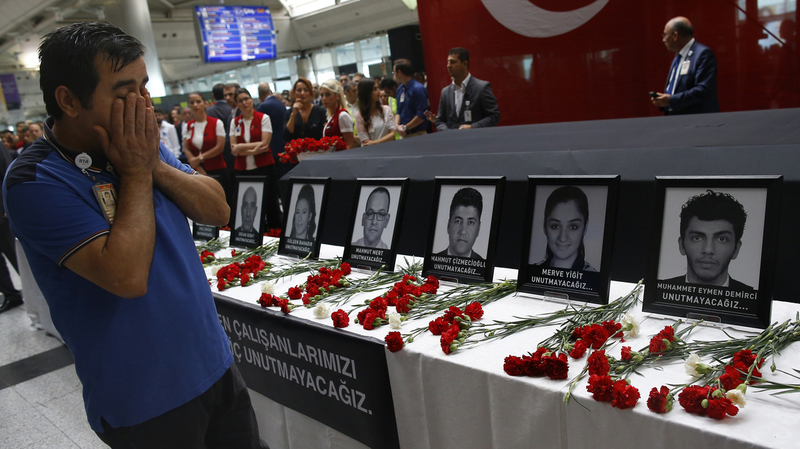 Family members and friends of the victims of the Istanbul attack paid tribute at a memorial service Thursday at Ataturk Airport. Turkish authorities say the evidence points to three Russian-speaking suicide bombers who were part of the Islamic State. In other cases, Muslim fighters were escorted to the border or were allowed to escape house arrest on the condition they leave Russia entirely. Not long after that purge, Russian-speaking fighters began appearing regularly in ISIS propaganda videos. This history is important because Turkish officials say the three suicide bombers who attacked Istanbul's Ataturk Airport last week, killing more than 40 people and wounding hundreds of others, were citizens of Russia and possibly from one of the former Soviet republics. If that proves to be accurate, it would mark the first time ISIS has tapped its Russian-speaking fighters to attack abroad. U.S. counterterrorism officials say it shouldn't be a surprise. Thousands of fighters have left Russia and the former Soviet republics to join ISIS. Moscow claims some 5,000 Russians have joined ISIS; U.S. officials say the number is probably closer to several thousand. Either way, it means that Russian-speakers make up large portion of the terrorist group. U.S. intelligence officials briefed on the Turkish investigation tell NPR they believe the three suicide bombers were among two dozen young men who went into Turkey from Raqqa, Syria, about a month ago. U.S. officials had received credible reports that ISIS had, in their words, "forward deployed" fighters into Turkey back in May. That is about the same time that Turkish officials say the three suicide bombers in this latest attack rented an apartment in a religiously conservative neighborhood in Istanbul. Initially, the intelligence community was concerned that ISIS fighters were moving into Turkey to launch attacks against targets in European capitals at the height of the summer vacation season. But, they say there was growing concern in recent weeks that Turkey might be in the crosshairs as well. Since last fall, ISIS had issued a steady drumbeat of threats against Turkey's President Recep Tayyip Erdogan. Turkey says the evidence they have so far points to ISIS, but no group has claimed formal responsibility. CIA Director John Brennan told the Council on Foreign Relations last week that he thought ISIS would be unlikely to claim responsibility for strategic reasons. "I think what they do is carry out these attacks to gain the benefit from it in terms of sending a signal to our Turkish partners," Brennan said on Wednesday. "But at the same time not wanting to potentially, maybe, alienate some individuals inside of Turkey that they might be still trying to gain the support of." Turkish investigators searched an apartment that the three suicide bombers are thought to have rented, and police found a Russian passport and papers described as "ISIS documentation," according to officials briefed on the investigation. It isn't clear if they found computers or other information that linked the three attackers directly to ISIS. But the discoveries could allow the group to make clear it was behind the attack without actually saying so formally. A couple years ago, as Muslims in Russia and the former Soviet-bloc nations were leaving for Syria, Belgian officials were watching a similar stream of fighters leaving their country as well. Belgian authorities turned a blind eye to the departures because, officials said later, the exodus included hundreds of ex-convicts and radical Islamists. One Belgian intelligence official told NPR last year that the Belgian police figured that the nation's budding jihadists and petty criminals would die for ISIS on the battlefields and wouldn't be a problem anymore. The plan backfired when those fighters returned with a vengeance. When shooting broke out across Paris last November, that decision came back to haunt European officials. Nearly all the gunman and suicide bombers who struck that night, killing 130 and wounding hundreds of others, were among that contingent of Belgians who had left to fight in Syria. Nearly all of them were known to Belgian and French authorities. Those linked to the Paris attack included Ibrahim and Khalid el-Bakraoui, two Brussels-born ex-cons who had been radicalized by ISIS. In March, Ibrahim el-Bakraoui blew himself up in the departure hall of Brussels Airport and his brother detonated an explosive-filled backpack in the Brussels metro. And the Istanbul attack last week echoed the one in Brussels. Both involved attackers who were driven to the airport in a taxi. In the Belgian case, the terrorists loaded explosives into suitcases and then detonated them. According to two officials briefed on the Istanbul airport explosions, the men who attacked Ataturk Airport hid guns in suitcases and were wearing suicide vests. In the Belgian case, the explosives appear to have been mixed in an apartment in Brussels. By contrast, Turkish officials do not believe that the airport bombs were made locally. They believe, after analyzing the explosives, that they came in with the bombers when they arrived from Syria. What makes ISIS different, and perhaps more effective, than terrorist organizations that preceded it is that its leadership has never treated foreign fighters like second-class citizens. In its early days, particularly when it was fighting in Afghanistan, al-Qaida was renowned for treating its non-Arab fighters like battlefield fodder. ISIS took lessons from this. It has carefully organized fighters by background and language. Former and captured ISIS fighters have talked about this extensively, European and U.S. intelligence officials say. The Paris suicide bombers, for example, were fighting together and living together as a French-speaking unit. ISIS released a propaganda video of the men together in uniform, in Syria, after the attacks. Similarly, fighters from Russia and the former Soviet republics are grouped together and until this past March, U.S. intelligence officials say, were thought to be fighting under the command of a man named Omar al-Shishani, also known as Omar the Chechen. U.S. intelligence officials say he became the Islamic State's minister of war and helped pull together a unit of Russian speakers who were considered ISIS' best marksmen and their most fearsome fighters. U.S. officials believe Omar the Chechen may have had a hand in planning the Istanbul attack before he was killed by a drone strike in March. Among the theories officials are pursuing: that Omar the Chechen was replaced by another Russian named Ahmed Chataev, who then finished the preparations for the Istanbul attack. Officials close to the investigation say it would have taken months to prepare the attack. There was clearly extensive surveillance of the airport as the gunmen appeared to know exactly where to go to kill the most people. U.S. and Turkish officials believe there could be more than a dozen people, in addition to the attackers, who could be involved. As a rule of thumb, counterterrorism officials say each terrorist needs three to five people supporting them in order to carry out an attack. The surprise, aside from the airport bombing itself, is that ISIS used its Russian-speaking fighters to do it. Before this incident, ISIS had kept these fighters close to home and used them as special forces to win key battles. The Russian-speakers were sent to fight in Fallujah. If Turkish official reports are correct, fighters from Russia and the former Soviet republics have a new, more ominous mission: inflicting maximum damage on soft targets beyond the ISIS heartland.